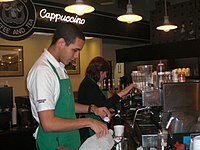 In 2014, university graduates from the U.S. were often unable to find a job requiring a degree; 44% could only find service jobs such as barista positions that do not require postsecondary education. Underemployment is the under-use of a worker due to a job that does not use the worker's skills, or is part time, or leaves the worker idle. Examples include holding a part-time job despite desiring full-time work, and overqualification, where the employee has education, experience, or skills beyond the requirements of the job. Underemployment has been studied from a variety of perspectives, including economics, management, psychology, and sociology. In economics, for example, the term underemployment has three different distinct meanings and applications. All meanings involve a situation in which a person is working, unlike unemployment, where a person who is searching for work cannot find a job. All meanings involve under-utilization of labor which is missed by most official (governmental agency) definitions and measurements of unemployment. "Overqualification", or "overeducation", or the employment of workers with high education, skill levels, or experience in jobs that do not require such abilities. For example, a trained medical doctor with a foreign credential who works as a taxi driver would experience this type of underemployment. "Involuntary part-time" work, where workers who could (and would like to) be working for a full work-week can only find part-time work. By extension, the term is also used in regional planning to describe regions where economic activity rates are unusually low, due to a lack of job opportunities, training opportunities, or due to a lack of services such as childcare and public transportation. "Overstaffing" or "hidden unemployment" or "disguised unemployment" (also called "labor hoarding"), the practice in which businesses or entire economies employ workers who are not fully occupied—for example, workers currently not being used to produce goods or services due to legal or social restrictions or because the work is highly seasonal. Underemployment is a significant cause of poverty: although the worker may be able to find part-time work, the part-time pay may not be sufficient for basic needs. Underemployment is a problem particularly in developing countries, where the unemployment rate is often quite low, as most workers are doing subsistence work or occasional part-time jobs. The global average of full-time workers per adult population is only 26%, compared to 30–52% in developed countries and 5–20% in most of Africa. In one usage, underemployment describes the employment of workers with high skill levels and postsecondary education who are working in relatively low-skilled, low-wage jobs. For example, someone with a college degree may be tending bar, or working as a factory assembly line worker. This may result from the existence of unemployment, which makes workers with bills to pay (and responsibilities) take almost any jobs available, even if they do not use their full talents. This can also occur with individuals who are being discriminated against, lack appropriate trade certification or academic degrees (such as a high school or college diploma), have disabilities or mental illnesses, or have served time in prison. Two common situations which can lead to underemployment are immigrants and new graduates. When highly trained immigrants arrive in a country, their foreign credentials may not be recognized or accepted in their new country, or they may have to do a lengthy or costly re-credentialing process. As a result, when doctors or engineers from other countries immigrate, they may be unable to work in their profession, and they may have to seek menial work. New graduates may also face underemployment, because even though they have completed the technical training for a given field for which there is a good job market, they lack experience. So a recent graduate with a master's degree in accounting or business administration may have to work in a low-paid job as a barista or store clerk–jobs which do not require a university degree–until they are able to find work in their professional field. Another example of underemployment is someone who holds high skills for which there is low market-place demand. While it is costly in terms of money and time to acquire academic credentials, many types of degrees, particularly those in the liberal arts, produce significantly more graduates than can be properly employed. Employers have responded to the oversupply of graduates by raising the academic requirements of many occupations higher than is really necessary to perform the work. A number of surveys show that skill-based underemployment in North America and Europe can be a long-lasting phenomenon. If university graduates spend too long in situations of underemployment, the skills they gained from their degrees can atrophy from disuse or become out of date. For example, a person who graduates with a PhD in English literature has advanced research and writing skills when they graduate, but if she or he works as a store clerk for a number of years, these research and writing skills will atrophy from disuse. Similarly, technically specialized workers may find themselves unable to acquire positions commensurate with their skills for extended lengths of time following layoffs. A skilled machinist who is laid off may find that she cannot find another machinist job, so she may work as a server in a restaurant, a position which does not use her professional skills. Given that most university study in Western countries is subsidized (either because it takes place at a state university or public university, or because the student receives government loans or grants), this type of underemployment may also be an ineffective use of public resources. Several solutions have been proposed to reduce skill-based underemployment: for example, government-imposed restrictions on enrollment in public universities in fields with a very low labor market demand (e.g. fine arts), or changes in degree cost structure that reflected potential labour market demand. A related kind of underemployment refers to "involuntary part-time" workers. These are workers who could (and would like to) be working for the standard work-week (typically full-time employment means 40 hours per week in the United States) who can only find part-time work. Underemployment is more prevalent during times of economic stagnation (during recessions or depressions). Obviously, during the Great Depression of the 1930s, many of those who were not unemployed were underemployed. These kinds of underemployment arise because labor markets typically do not "clear" using wage adjustment. Instead, there is non-wage rationing of jobs. Underemployment can also be used in regional planning to describe localities where economic activity rates are unusually low. This can be induced by a lack of job opportunities, training opportunities, or services such as childcare and public transportation. Such difficulties may lead residents to accept economic inactivity rather than register as unemployed or actively seek jobs because their prospects for regular employment appear so bleak. (These people are often called discouraged workers and are not counted officially as being "unemployed.") The tendency to get by without work (to exit the labor force, living off relatives, friends, personal savings, or non-recorded economic activities) can be aggravated if it is made difficult to obtain unemployment benefits. Relatedly, in macroeconomics, "underemployment" simply refers to excess unemployment, i.e., high unemployment relative to full employment or the natural rate of unemployment, also called the NAIRU. Thus, in Keynesian economics, reference is made to underemployment equilibrium. Economists calculate the cyclically-adjusted full employment unemployment rate, e.g. 4% or 6% unemployment, which in a given context is regarded as "normal" and acceptable. Sometimes, this rate is equated with the NAIRU. The difference between the observed unemployment rate and cyclically adjusted full employment unemployment rate is one measure of the societal level of underemployment. By Okun's Law, it is correlated with the gap between potential output and the actual real GDP. This "GDP gap" and the degree of underemployment of labor would be larger if they incorporated the roles of underemployed labor, involuntary part-time labor, and discouraged workers. The third definition of "underemployment" describes a polar opposite phenomenon: to some economists, the term refers to "overstaffing" or "hidden unemployment," the practice of businesses or entire economies employing workers who are not fully occupied (in other words, employees who are not economically productive, or underproductive, or economically inefficient). This may be because of legal or social restrictions on firing and lay-offs (e.g. union rules requiring managers to make a case to fire a worker or spend time and money fighting the union) or because they are overhead workers, or because the work is highly seasonal (which is the case in accounting firms focusing on tax preparation, as well as agriculture). The presence of this issue in white collar office jobs is described in the boreout phenomenon, which posits that the major issue facing office workers is lack of work and boredom. This kind of underemployment does not refer to the kind of non-work time done by, for instance, firefighters or lifeguards, who spend a lot of their time waiting and watching for emergency or rescue work to do; this kind of activity is necessary to ensure that if (e.g.) three fires occur at once, there are sufficient firefighters available. This kind of underemployment may exist for structural or cyclical reasons. In many economies, some firms become insulated from fierce competitive pressures and grow inefficient, because they are awarded a government monopoly (e.g., telephone or electrical utilities) or due to a situation of abuse of market power (e.g., holding a monopoly position in a certain industry). As such, if they may employ more workers than necessary, they might not be getting the market signals that would pressure them to reduce their labour force, and they may end up carrying the resultant excess costs and depressed profits. In some countries, labour laws or practices (e.g. powerful unions) may force employers to retain excess employees. Other countries (e.g. Japan) often have significant cultural influences (the relatively great importance attached to worker solidarity as opposed to shareholder rights) that result in a reluctance to shed labour in times of difficulty. In Japan, there is a long-held tradition that if a worker commits to serve a company with long and loyal service, the company will, in return, keep the worker on the payroll even during economic downturns. In centrally-planned economies, lay-offs were often not allowed, so that some state-run companies would have periods when they had more workers than they needed to complete the organization's tasks. Cyclical underemployment refers to the tendency for the capacity utilization of firms (and therefore of their demand for labor) to be lower at times of recession or economic depression. At such times, underemployment of workers may be tolerated—and indeed may be wise business policy—given the financial cost and the degradation of morale from shedding and then re-hiring staff. Alternatively, paying underused overhead workers is seen as an investment in their future contributions to production. This kind of underemployment has been given as a possible reason why Airbus gained market share from Boeing. Unlike Airbus, which had more flexibility, Boeing was unable to ramp up production fast enough when prosperous times returned because the company had dismissed a great part of its personnel in lean times. Another example is the tourism sector, which faces cyclical demand in areas where attractions are weather-related. In some tourism sectors, such as the sun and sand tours operated by Club Med, the company can shed bartenders, lifeguards, and sports instructors, and other staff in the off-season, because there is such a strong demand amongst young people to work for the company, because its glamorous beachfront properties are desirable places to work. However, not all tourism sectors find it so easy to recruit staff. Some tourism sectors require workers with unusual or hard-to-find skills. Northern Ontario hunting and fishing camps that require skilled guides may have an incentive to retain their staff in the off-season. Another example is companies which run tours for foreign tourists using staff speaking the travelers' native tongue. In Canada, guided tours are available for Japanese and German tourists in their native languages; in some locations, it may be hard for companies to find Japanese- or German-speaking staff, so the companies may retain their staff in the off-season. ^ O'Brien, Matt (19 November 2014). "Baristas of the world unite: Why college grads may be stuck at Starbucks even longer than they thought". Retrieved 7 April 2018 – via www.washingtonpost.com. ^ Chohan, Usman W. "Young people worldwide fear a lack of opportunities, it's easy to see why" The Conversation. September 13, 2016. ^ Chohan, Usman W. "Young, Educated and Underemployed: Are we Building a Nation of PhD Baristas" The Conversation. January 15, 2016. ^ Felices, G. (2003). Assessing the Extent of Labour Hoarding. Bank of England Quarterly Bulletin, 43(2), 198–206. ^ Gallup, Inc. "Gallup Global Employment Tracking". Retrieved 15 October 2014. ^ Vedder, Richard; Denhart, Christopher; Robe, Jonathan (January 2013). "Why are Recent College Graduates Underemployed? : University Enrollments and Labor Market Realities". Center for College Affordability and Productivity. Retrieved June 2, 2013. Increasing numbers of recent college graduates are ending up in relatively low-skilled jobs that, historically, have gone to those with lower levels of educational attainment. ^ Pappano, Laura (22 July 2011). "The Master's as the New Bachelor's". The New York Times. Retrieved 17 January 2017. ^ Lederman, Doug (23 May 2018). "The Bad First Job's Lingering Impact". Inside Higher Ed. Retrieved 28 May 2018. New report finds that bachelor's degree recipients whose first job does not require degree are more likely to remain "underemployed" five years later -- and women fare worse than men. Dooley, David and JoAnn Prause. The Social Costs of Underemployment: Inadequate Employment as Disguised Unemployment. Cambridge University Press. ISBN 978-0-521-81014-2 | ISBN 0-521-81014-0.